IQ may be on the rise and we know what EQ means but what about CQ? In 1958, Professor Ellis Paul Torrance created a series of tasks to measure creativity. The accepted definition of creativity is the production of something original and useful and that’s what’s reflected in the Torrance tests. There is never one right answer – instead, creative thinking requires generating many unique ideas and combining those ideas into the best result. For example, children who participated in Torrance’s first round of creativity tests in 1958 were given a toy fire truck and asked how it could be improved and how it could be made more fun to play with. 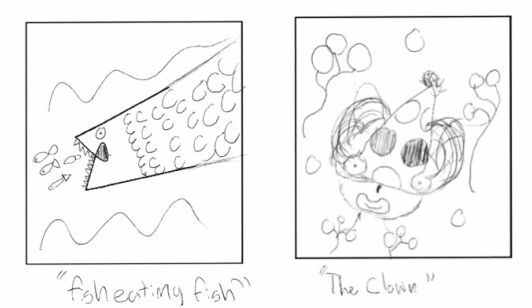 The modern test includes being given parts of pictures to complete, Mr Squiggle style (as shown above). Four hundred children who were part of the original study by Torrance have been tracked since that time and remarkably, Torrance’s creativity index predicted those kids’ creative accomplishments as adults. Those who came up with more good ideas on Torrance’s tasks grew up to be entrepreneurs, inventors, authors, doctors, diplomats and software developers. Since the tests were developed they have been undertaken by millions worldwide and one interesting trend has emerged. When measuring intelligence, or IQ, there is a phenomenon called the Flynn effect—each generation, scores go up approximately ten points. Enriched environments are making kids smarter. With creativity, or CQ, a reverse trend has just been identified in the US – effectively creativity scores are falling and have been since 1990. This trend is particularly noticeable in younger children. What to do? Clearly there are plenty of researchers who will be turning their (creative) minds to this very question but from this mum’s point of view, I suspect the answers are all about getting back to basics and providing our children with open-ended play opportunities.